Well the human spirit is something that you can't keep down - our local bulletin board may be off line because of 'legal difficulties' but when people come together great things can happen as was proven today when the joint US & European mission to Saturn and Titan successfully sent a probe to this distant world. We can all celebrate this moment as our taxes helped pay for this endeavour and the Irish are fully paid up members of the ESA (European Space Agency) so somewhere on this little probe is a little tricolour (Ole, ole, ole !). I heard Leo Enight on 2FM this morning telling a story about an Irish guy that works for JPL (Jet Propulsion Labs) in the US and that it's been his job for the last seven years to keep a track on the Cassini probe to make sure it survived it's long journey to Saturn and it's moons - someone buy that man a meejum ! Of course the other important bit of news that I have for ye is that by sometime this afternoon the signature of a Castlebar man will also be resting on the surface of Titan. How did I manage that ? Well back when Castlebar.ie was getting up and running and we were all excited about the prospect of Mayo winning All-Ireland Finals and Castlebar winning the Information Age Town, the ESA had a website setup to collect the signatures of European citizens for inclusion on a CDROM that would be attached to the Huygens probe that was sent to Titan. 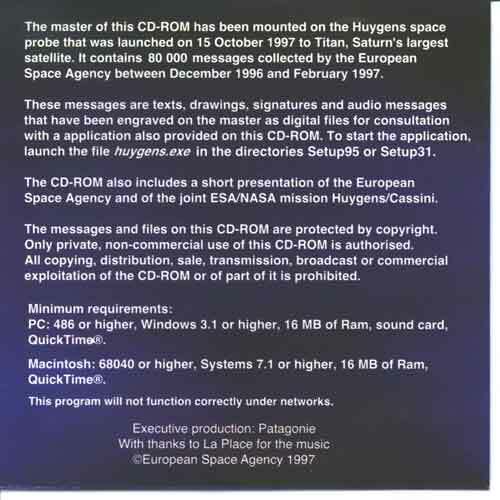 I stuck my scrawl on the website and never thought any more of it 'til I received a package in the post one day in 1997 with a replica of the CD that was winging it's way across the solar system to that methane moon Titan. It was filed away and forgotten about . . . until I started to hear reports on the Cassini-Huygens mission before Christmas and thought that I'd better try and find that CD. One problem that I had was that in order to read it I had to dig out an old Win95 PC (this is something that we should be worried about . . . our data and records need to be viewable by future generations and having them stuck in a proprietary format instead of an open standard format could lead to massive amounts of data loss) anyway the CD hasn't 'rotted' and I can still read the data on it so whilst I didn't touch the face of God today, he does have my signature. When something of this magnitude happens it always reminds me that it's a small little planet that we all live on so the least we should do is to try and get on with one another - a peaceful 2005 to you all !